Get your first class up and running with these simple steps. Wet Ink lets you to create exciting and lively writing-focused classes with ease. This quick start article will help you learn the basics so you can get going. 1. Create a new class. 2. Complete the questionnaire to create your class. Name your class and choose your class type. 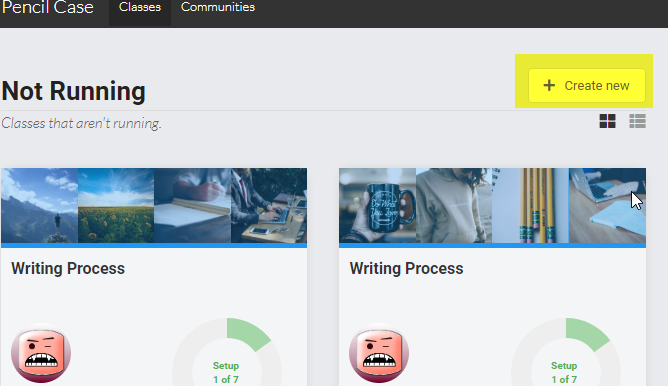 Wet Ink offers three class structures: Group (for multiple students, with or without lessons or an instructor), self-paced classes (single student), and one-on-one mentorship (single student and one instructor). Group classes are the most commonly used at Wet Ink. Choose whether the class has lessons, how many and how long they will last. Name each lesson and provide a brief description. 3. Follow the class checklist to complete your class. Edit your welcome announcement -- the first announcement that is posted and emailed to your students. Edit your lessons by adding content block, readings, and writing assignments. When the lesson content is complete -- though you can always edit it at any time -- you can start your class and enroll your students.